Dr. James Ponder is a native of northern California and was raised in Monterey until moving to Davis to complete his education. After receiving his BS in Zoology at UC Davis, James Ponder completed his Master’s research on the feline nutrition project that determined the taurine requirement for cats. The subsequent addition of this nutrient in the higher quality diets has prevented blindness in countless cats. In 1985 Dr Ponder graduated from the most respected veterinary school in the world, U.C. Davis. James and his wife, Mary Ann, moved back to their home turf in 1986 and purchased Romie Lane Pet Hospital in Salinas in 1987. In addition to general practice and medicine, Dr. Ponder has a strong interest in pain management, orthopedics, lameness and surgery. In 2000 he became the first vet in Salinas to become certified in veterinary acupuncture and successfully treats small animals and horses with the addition of that modality . He has also had extra training in behavior and his continuing education covers a wide variety of up-to-date research and surgical skills. Dr. James Ponder is so concerned about his patients and clients that he gives them all his home phone number so that they can contact him after hours when they have emergencies or questions. If he isn’t home, the answering service will track him down. He has even taken calls on the ski slopes and while wakeboarding with his family. 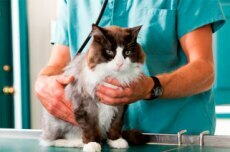 Romie Lane Pet Hospital is the only veterinary hospital in Salinas with this service. His wife gladly answers the phone in the middle of the night because; “I assumed it would be part of our lives when we were married. It’s what I would expect from my own vet, even if I wasn’t married to him”. Mary Ann worked her way through college by working in office environments and doing bookkeeping for businesses. In addition, she worked for a Davis horse trainer; training and assisting with breeding. When she graduated from UC Davis with a degree in Animal Science, she received the Departmental Citation granted to the highest GPA among the graduates. Mary Ann worked in the Financial Aid office at UC Davis for over four years after graduating. She became a supervisor over four other staff as well as balancing all of the financial aid accounts every year. After moving to Aromas, Mary Ann concentrated on raising their two sons, Chris & Tommy, and raising Thorougbred horses. She calls herself a Little League mom and she and Dr Ponder held almost every possible position a team can have. They even kept score and did the announcing at many games. They were also very active in the Aromas Boy Scouts. Mary Ann used her exceptional math abilities as a volunteer tutor at Aromas School for 12 years and has taught Sunday School at their church since the kids were little.